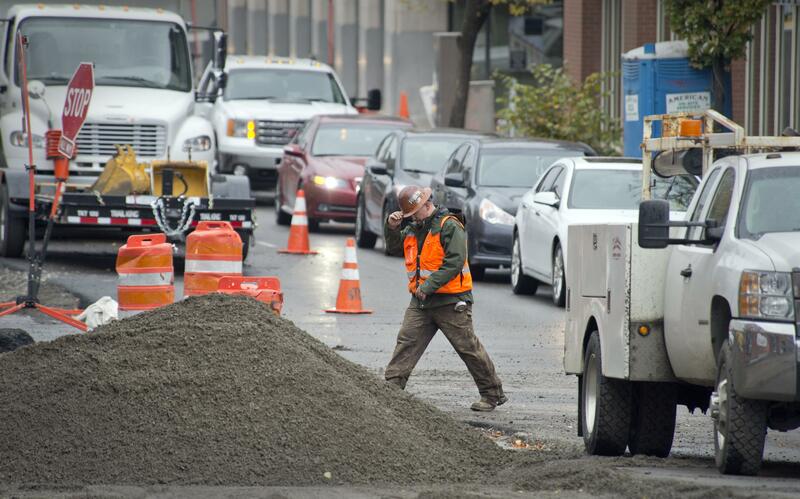 UPDATED: Thu., Oct. 4, 2018, 10:02 p.m.
Two lanes of Monroe Street in downtown Spokane will be closed for almost two months while Avista works on its 100-year-old electrical system below the street. The work between Main and Sprague avenues will begin Monday and wrap up, after seven weeks, on Nov. 23. Monroe’s two westernmost lanes will be closed for the duration. The utility company’s work to rehabilitate a century-old subterranean vault below Riverside Avenue at Monroe needs to be done before the city brought brings a nearby sewage tank into service. Marlene Feist, director of strategic development for the city’s public works department, said the utility’s lines need to be upgraded to feed power to the city’s sewage tank. “The infrastructure they have there won’t accommodate what we need for the tank,” Feist said, noting that the tank’s pumps, air scrubbers, monitors and mechanical room need power to operate. The city partly closed the arterial, which sees more than 14,000 vehicles on an average day, for major construction in 2016 and 2017. Though the city has a goal of combining street and utility work to lessen the impact such work has on commuters, as well as to avoid pavement patches that can lead to potholes, Avista didn’t do the work then because it “was outside of the boundaries of the city’s project scope at the time,” said David Vowels, an Avista spokesman. The underground vault is below Riverside, not Monroe. The utility company and its contractor on the job, Potelco, will use heavy equipment during the work, including a crane and excavator. Flaggers will help to control traffic. No electrical outages are expected. Published: Oct. 3, 2018, 5:08 p.m. Updated: Oct. 4, 2018, 10:02 p.m.